When it comes to predicting what the housing market will do next, we wish we had a fortune teller’s crystal ball. It would sure make all of our lives easier! Unfortunately, magic like that doesn’t exist, but there is a lot of hard data and smart people to pour over it, and that’s pretty darn close to magic! 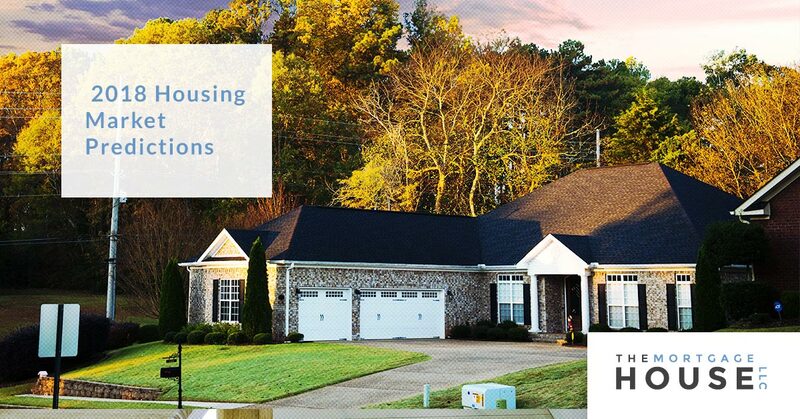 As Fayetteville’s Top Rated Local® mortgage broker, The Mortgage House LLC is always interested in the ebbs and flows of the housing market to ensure that our clients get the most out of their mortgage loan! With that in mind, here’s our quick list of 2018 housing market predictions. We’re curious to see if they become true! For the first time in nearly a decade, there will be fewer new homes built than the demand for them. This is a historic reversal of a very long trend. The Wall Street Journal suspects this is because the cost of land to put new homes on and the cost of constructing those new homes have doubled since the last housing boom in the late 2000s. This decline in the number of homes built is a reaction to tightened housing regulations in towns and cities across the nation. These regulations are being put in place by communities to prevent overcrowding in urban and suburban areas and to ensure that the population density of a region does not outpace its utilities and infrastructure. Additionally, many communities have set up other regulations as a response to a land shortage in highly prized areas. Concurrently, there is a shortage of construction labor and material available, meaning that many estimate that only 900,000 homes will be built in 2018. The dearth of materials and labor is a result of the numerous hurricanes and wildfires that have rocked the nation for the last few years. Materials typically used for the construction of new homes are now being utilized to rebuild communities devastated by natural disaster. These 900,000 homes are far fewer homes than the approximately 1.3 million needed to meet the demand for new homes. Incredibly, the national price of a home has risen for 23 consecutive months. These prices will continue to rise in 2018, but the rate by which it climbs will begin to slow. The catalyst for these rising prices are numerous and include low-interest rates being offered to home buyers, low employment rates across the nation, and the gradual expansion of the economy. These factors may shift in 2018, with laws and regulations being added or removed. Accordingly, housing prices should reflect these changes. The decade-long decline in homeownership rates finally began to reverse and climb in 2017. This means that younger generations can finally begin to consider owning a home. Larger economic factors kept the millennial generation from owning their own homes up until this point. In order to own their own home, many millennials will move out of concentrated urban areas, and into suburban areas that have home prices more in line with their financial assets. A more stable economy means that millennial workers are finally finding careers with appropriate pay rates, and low mortgage rates mean that homeownership is a reality for many first-time home buyers. While mortgage rates for 2018 will rise, they won’t be much higher than in 2017. In December of 2017, the Federal Reserve increased their short-term interest rates to 1.25-1.5 percent. Typically, this has a measured effect on mortgage rates, but many experts are sensing that this will not have the impact in 2018 that it has in the past. Indeed, many experts feel that mortgage rates will dip below 4 percent at some point during the year, the jump about 4.5 percent, and finally settle in around the 4.5 percent mark at year’s end. Despite these fluctuations and slightly higher rate, these rates are still very low. If you’re looking to buy a home in Fayetteville, let the specialists at The Mortgage House LLC work their magic. We understand the housing market can fluctuate at any time. By working with a mortgage broker, we can ensure that you and your loan are not affected by the shifting of the market. We’ll help maintain your loan rates during the entirety of the home buying process. Our entire loan process is available online to make it even easier on you! If you’re ready to buy a home, schedule an appointment with us today.